Roman coins of Geta, 198-212 AD. Most collectors collect Roman imperial coins "by building up a series of the portrait coin of the various emperors," as noted by Gilbert Askew in his introduction to the 1948 edition of Roman Coins and Their Values. Sometimes collectors must choose between several different portrait styles of a single emperor, particularly when that emperor aged substantially in office. Geta, the younger son of Septimius Severus, is a case in point. Geta silver denarius. 19 mm. Struck 211 at Rome after the death of Severus. His last, most adult, issue, distinguished by his full beard. Born May 27, 189, he was not yet four when his father's contest for the empire with Pescennius Niger and Clodius Albinus began in April, 193. Coinage of Severus and his wife Julia Domna commenced immediately, but the coinage of Geta did not begin until he was made Caesar when he was nine after the summer campaign of 198 [Figure 2]. In contrast to his brother who was one year older and had became Caesar at eight in 196 and Augustus in 198 at age ten, Geta's promotion to Augustus was delayed until Autumn 209 when he was 20. Their corrosive sibling rivalry probably played a role and it was surely only Severus and Domna, not Caracalla, who wanted Geta promoted at all. Two years later, on his deathbed in York, Britain, Severus acknowledged the animosity by first advising "Keep on good terms with each other" before going on to say "Be generous to the soldiers and take no heed of anyone else." After his father's death on Feb. 4, 211, Geta reigned jointly with his brother for a year until he was murdered by Caracalla on Feb. 1, 212. Of course, his portraits show major changes as he aged from nine to twenty-two. If a single representative portrait is required, the most mature one would be on a coin of Geta as Augustus. 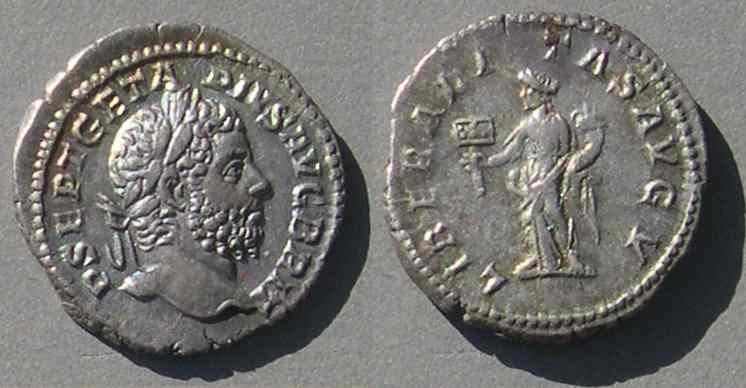 His last denarius issue, from late 211, shows him fully bearded [Figure 1]. On the other hand, part of the interest of his story is his youth. Naturally, his early coins portray him as a child (Figures 2, 3, 4, and 5 from 198, 199, 199, and 201 respectively). Close inspection of the legends shows a name change, which has been assigned to 199. The coins of 198 shows the legend with initial "L", for Lucius, the Praenomen of his father, L. Septimius Severus, which is shortly replaced by "P", for Publius, the praenomen of his uncle, P. Septimius Geta. The authors of BMC were unable to find a reason for this change, but collectors should be aware of it when seeking the youngest portrait of Geta. Look for the "L". Geta silver denarius. 18 mm. Felicity standing right holding cadeuceus in laft and clasping hands with Geta holding cornucopiae. Geta silver denarius, 20-18 mm. 3.66 grams. Note the initial "L", which is on his first issue. and grasping her dress in her heft hand. Sear 7202. BMC (SS&C) 688. Geta silver denarius. 19-18 mm. 3.44 grams. This legend begins with P. In 199 his first name changed from L (Lucius) to P (Publius). Nobilitas standing right holding vertical scepter and palladium. Sear 7184. RIC 13a. BMC 223. Hill 414. Struck 201 at Rome AR 19. This article was first published in The Celator, volume 11.3, March 1997, pages 40-41. Figures 3 and 4 have since been added. For more about Geta and Caracalla on pages by Bill Welch, see here. His site also has many other interesting pages.